MINNEAPOLIS — In the clubhouse, Brian Duensing sat facing his locker with his head down. After yet another tough outing and a 9-3 loss to the Rangers on Friday night, the Twins’ lefty was not in a hurry to talk about it. When he did, Duensing was asked if it was the most frustrated he had been after a start this season. It was a cold, rainy night at Target Field, and sloppy playing conditions were accompanied by a sloppy second inning that was too much for the Twins to overcome. Bad weather is nothing new for Duensing. After a strong first month of the season, Duensing’s struggles started May 7, when he had his start cut short after two innings due to a rain delay. He gave up just one run on three hits, but took the loss as the Twins were shut out, 4-0. Three days later, Duensing pitched two innings in relief of Francisco Liriano after a 64-minute hail delay. Duensing allowed two runs on three hits as the Twins lost, 10-2. Things really got bad in his next four starts, though. Over 20 2/3 innings of work, Duensing allowed 21 runs on 28 hits, going 0-3 with a 9.15 ERA in his last four May starts. He finally appeared to have turned the corner in his last start, tossing eight scoreless innings against the Royals. As the rain started to come down in the top of the second, the Rangers started to pile up runs. Duensing surrendered six hits in the inning, which led to seven runs, three of which were earned. After opening the inning with a walk and a strikeout, Duensing gave up a single to Mike Napoli that was followed by a Jason Repko error in center field that plated the first run of the game. Another single scored the second run before an Alexi Casilla error allowed another runner to reach base. Duensing then surrendered another pair of singles, struck out Josh Hamilton and gave up a single and double before getting out of the inning with a flyout. Over his last six starts, even including the brilliant outing in Kansas City, Duensing has gone 1-4 with a 7.04 ERA. Gardenhire replaced Duensing after two innings, bringing in right-hander Anthony Swarzak. In six innings of relief, Swarzak gave up two runs on six hits. Swarzak tossed 101 pitches, providing a bright spot for the Twins on the night as he saved Gardenhire from having to use up the bullpen. Rangers lefty C.J. Wilson was effective against the Twins, allowing just three runs on eight hits over seven innings. After battling through the same tough conditions, Wilson sympathized with Duensing’s tough night. Michael Cuddyer swung the bat well, driving in Drew Butera with a single in the fifth, while also collecting a double and a pair of walks. But it was the bottom of the order did most of the damage for Minnesota, as Repko doubled and scored in the second on a Matt Tolbert single, and Butera went 3-for-4 with a double, an RBI and a run scored. Three hits marked a career high for Butera. ZUMBROTA, Minn. — Those who knew Patrick Gadient would tell you he did not like to be the center of attention. Imagine what he would have thought of the Twins holding a ceremony Tuesday morning in his honor. One of the 14 black spruce trees from Target Field was planted just beyond the center field fence at Zumbrota Mazeppa High School, creating a memorial to Gadient, a Class of 2006 graduate who was killed in a car accident on Feb. 3, 2011. 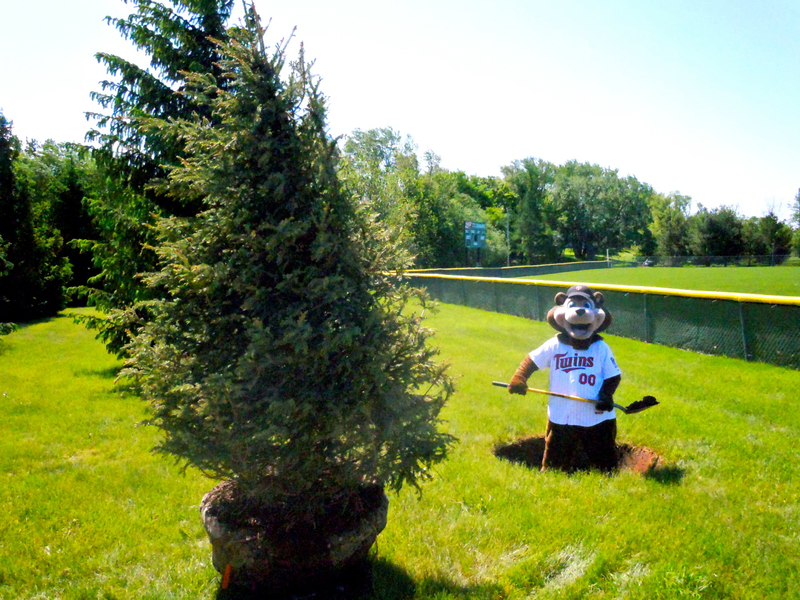 The tree was awarded to Twins season-ticket holder Dan Flaaen through the club’s “Sweet Spot” program. When the Twins decided to remove the trees from beyond the center-field fence at Target Field, season-ticket holders had the opportunity to submit a video on why they deserved to have a black spruce tree from the inaugural season at Target Field. Flaeen, a friend and classmate of Gadient, teamed with another classmate, Bobbie Ersland, to submit a video in their friend’s honor. At Tuesday’s ceremony, Flaeen and Ersland spoke along with Gadient’s sister, Karen Lang, and Zumbrota Mazeppa High School Principal Erik Enger. They spoke of Gadient’s personality and his love not only for baseball but life in general. Enger commended Flaaen and Ersland for seeing the opportunity and taking advantage of it to honor their friend. The video, titled “Spruce for Pat,” was filmed at Zumbrota Mazeppa, using video equipment from the high school, along with photos of Gadient from his Facebook page. It details Gadient’s popularity among his friends, his love for outdoor activities and his connection to the Twins as a baseball player. Twice during his career, Gadient had the opportunity to play at the Metrodome on the same field as his heroes. After placing among the five finalists, Flaaen and Ersland spread the word to friends and family to vote for the video. The response snowballed as the people they contacted sent it to other people they knew, then so on. The video received 69 percent of the vote, winning easily as no other video got more than 26 percent. Gadient was engaged to be married to his high school sweetheart, Briana Darcy of Mazeppa, in July. But as he drove home from work on that February night, his car hit a patch of ice and slid into oncoming traffic. He may never get to play baseball again or go to another Twins game, but as the Target Field black spruce grows beyond left-center field at the Zumbrota Mazeppa baseball field, it will serve as a reminder of Gadient. As his friends and family see it, Gadient will get to watch his younger brother, Kurt, play on the field. Even after his brother has graduated, they believe Gadient will be watching over the field and the school. “Just like when we were in class and he’d be joking around and everyone would draw the attention to him, we knew that happen with this tree, too,” Ersland said. “Let’s make this about him, and the attention was drawn towards, ‘Everyone vote for this tree so we can plant it for Pat, so that he can be remembered all the time. MINNEAPOLIS — For all the home runs he hit in his career, and the impressive distances they traveled, it was Harmon Killebrew’s personality that left a lasting impact on his friends, family, former teammates and the Twins organization. They made that clear Thursday night at Target Field, when several current and former Twins shared their memories of the Hall of Fame slugger. Carew shared a story, about the nicknames he and Killebrew had for each other. Carew never explained why he called Killebrew by the name “Charlie,” but it gave everyone in attendance a look into their close relationship just the same. Michael Cuddyer and Justin Morneau shared their thoughts, and a video from former Twins Gold Glover Torii Hunter was shown on the video board as well. Each described the way Killebrew helped them change their signatures to make them more legible for fans. Killebrew’s autograph — which was added to the wall in right at Target Field — was among the best in baseball, and he made it a point to ensure that fans could tell it was his. It was one of many examples of the concern Killebrew had for others, no matter their status in life. When he reached the podium, Paul Molitor shared a note about his signature as well, in one of the more lighthearted moments of the night. Molitor talked about another common topic regarding Killebrew, his nickname. Like many Twins fans, Molitor grew up idolizing Killebrew as a child. He recalled the way players would always fight over the No. 3 jersey when he played Little League. Now a Hall of Famer himself, Molitor eventually became close friends with his idol. As much as they remembered him for his kindhearted nature, Killebrew’s friends and former teammates were among his biggest fans, too. And just like any other Twins fan, they loved to see him hit the ball out of the park. MINNEAPOLIS — He was a fan favorite in Minnesota during his playing days, and several thousand fans turned out Thursday night for Harmon Killebrew’s memorial service at Target Field. Killebrew was a legendary figure among Twins fans for the way he hit towering home runs at Metropolitan Stadium, and a hero for the way he exuded class off the field. After he left a lasting mark on their lives, Twins fans made the trip to the ballpark Thursday to pay one last tribute to Killebrew. When Twins fans came to the ballpark in the 1960s, they wanted to see Killebrew hit one of his classic, long home runs to left field. Having hit 573 during his career, Killebrew often granted their wish. Some were not so lucky. Whether they got to see them in person or not, the one thing fans most closely associated with Killebrew — besides his genuine personality — were his home runs. The ceremony, which featured speeches from several former players, Commissioner Bud Selig and Killebrew’s wife, Nita, received excellent reviews from the fans in attendance.